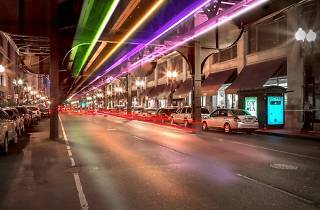 An interesting Kickstarter campaign is looking to bring an interactive light installation beneath the El tracks on Wabash Avenue between Monroe and Adams streets. 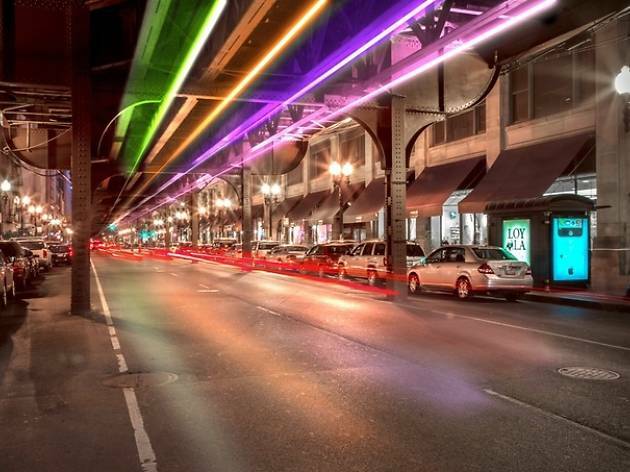 The project, dubbed The Wabash Lights, is a proposed work of public art that will incorporate more than 5,000 programmable LED lights along the Loop street. The project's founders, Seth Unger and Jack Newell, are collaborating with the Chicago Transit Authority and the Chicago Department of Transportation to create a "beta test" for the undertaking and need the public's help to help pay for it. Their Kickstarter campaign is seeking $55,000 to install a small run of lights to demonstrate the idea. If all goes well, Unger and Newell plan to start a capital fundraising campaign with a goal of $5 million in private, foundation and corporate funding. The lights in question will be able to glow in a medley of colors and patterns. They'll be programmable, meaning anyone will be able to go onto their phones or computers to customize how the lights appear. The Wabash Lights project will take a couple of years to come into fruition. The Wabash side of the Loop El tracks is currently under construction, and the horrendous Madison/Wabash stop closed in the spring and is set to be demolished. The city is investing a good deal of money into renovating the Wabash El tracks, and a stretch of glowing lights would definitely bring some extra flair.